Every social media marketer knows the importance of hashtags, and they can be incredibly beneficial when used effectively. However, just because you create a hashtag doesn’t mean your audience will latch onto it – you’ll first need to capture their attention. 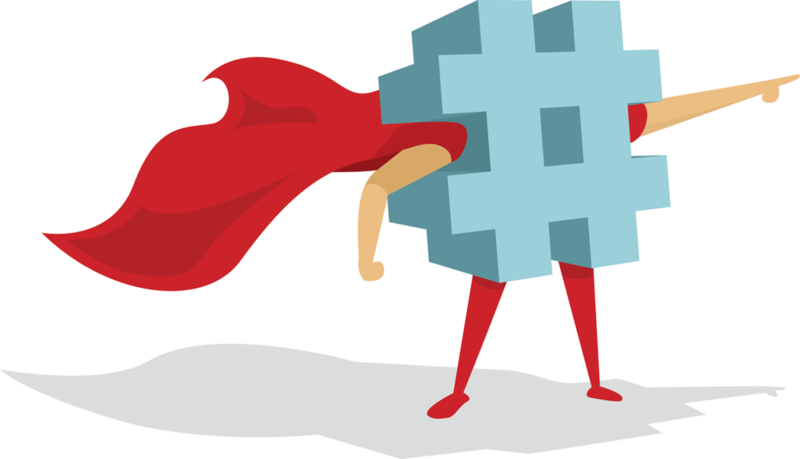 Crafting strong, memorable hashtags is a smart method for getting your audience engaged. They’ll give users a new way to get involved with the conversation surrounding your business, and even open the door for some User-Generated Content (UGC). In this post, we’ll explain how to create hashtags that your audience is likely to actually use. Let’s get started! In social media terms, a hashtag is the # symbol followed by a key term or phrase (without any spaces). This phrase is usually attached to a larger concept – whether that’s a business, product, or current trend. The hashtag can be used to promote or organize the concept it refers to, bringing a wider online audience into the discussion. For example, Apple uses the #todayatapple hashtag to share details on Twitter about the day-to-day life of the company. 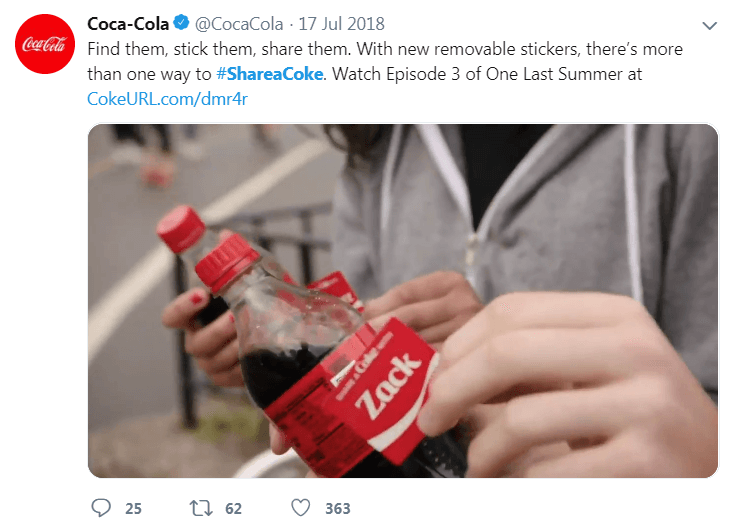 During that campaign, consumers were encouraged to find bottles of Coca-Cola that featured their names – and to share images of them on social media using the relevant hashtag. More than 500,000 photos were shared, and customers created over six million custom Coke bottles. Using hashtags strategically can help your content reach more of its intended audience – increasing the amount of potential customers who will see it. This can in turn lead to boosted site traffic, an increase in conversion rates, or even just more exposure for your business. Studies have shown that tweets containing a hashtag tend to get twice the level of engagement of those without. In other words, hashtags are a great way to get your audience involved. Many brands use them as a way to prompt User-Generated Content (UGC), encouraging customers to share images that relate in some way to their products or services. Of course, it’s important to note that not all hashtags are created equal. Many brands saturate their content with too many or irrelevant hashtags. These are unlikely to be used, and may actually decrease engagement. Turning your attention towards creating fewer, well-thought-out hashtags is a much more effective marketing method. Although there are numerous considerations when you’re crafting a hashtag, it’s important to always remember the three core rules. There should be no spaces, no punctuation, and no special characters. Failing to abide by these guidelines will make your hashtags difficult to use – something you’ll definitely want to avoid. After that, there are a few more techniques you can apply if you’d like to get the most possible benefit out of your hashtags. Let’s take a look at a few of the best strategies you’ll want to keep in mind. To encourage maximum engagement, you’ll need to make it easy for people to get involved. Overly corporate and formal hashtags can leave your audience feeling alienated. What’s more, they’re unlikely to use something that has no personal relevance. This encourages users to post original content using it whenever they fly with Alaska Air. Adopting a similar strategy can be an excellent way to encourage your own UGC. Including UGC on your site helps to build user trust, and can increase the likelihood of conversions as a result. In fact, 85% of consumers find UGC more influential than content that comes directly from brands, making it an effective (and budget friendly) marketing tool. You can further solicit audience participation by re-posting any images you receive to your brand channels along with the related hashtags – just make sure you get the users’ permission first. Along with being personal, the hashtags you use also need to appeal to your audience’s core interests. If they don’t, people simply won’t use them – regardless of how much you encourage their involvement. Fortunately, social media is the perfect place to learn more about your audience. You can start by making use of the trending and explore pages on sites like Instagram and Twitter. There, you can usually find a hub of information that relates to your industry or niche. Free tools like AllTop are also a useful way to identify current trends. 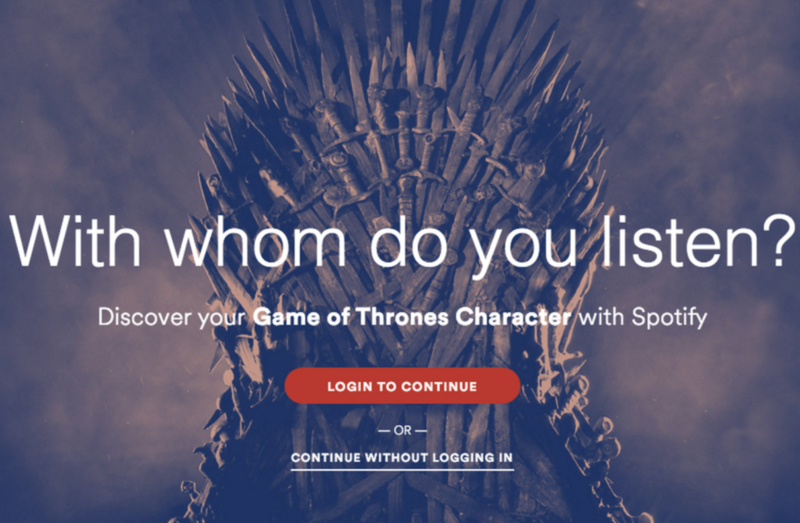 This hashtag bought Game of Thrones fans together with character-inspired playlists. A trend doesn’t have to relate directly to your business in order for you to take advantage of it – so be creative, and look for unexpected connections. As with any element of your marketing strategy, frequent maintenance is required to keep your hashtag use at maximum effectiveness. This is because trends change and audiences move on – and pushing the same old hashtags too long can make you seem a bit desperate. Therefore, you’ll want to carefully plan a specific time period for each of your hashtag campaigns, and decide in advance how many you’ll create. This will also help you track the results, and identify any areas for future improvement. For example, you might find that your audience engaged well with one of your hashtags, but ignored another. This gives you a clearer idea of the steps you’ll need to take with your next campaign, in order to make it a success. Tools like Sprout Social make tracking your hashtags easy, as they tend to offer a range of features that will help you collect concrete data. You can even compare your hashtags against competitors by using the Twitter Comparison Report service. Hashtags are a powerful marketing tool, although they can be difficult to master. Many brands have tried and failed to craft effective strategies – however, all you need to do to succeed is keep your audience firmly in mind. That way, you can encourage user participation and boost the visibility of your brand as a result. Use personable and actionable language to directly involve your audience. Research the current trends your audience is likely to be interested in. Regularly track and review the hashtags you use. Do you have any further questions about using hashtags? Let us know in the comments section below!